Seismic reflection surveying is the most widely used geophysical technique to explore for hydrocarbons. The measurement of the Earth’s gravity and magnetic fields are also used to determine the geometry and depth of particular subsurface areas, known as sedimentary basins, where oil and gas are typically located. The collection of seismic data involves sending small acoustic pulses into the ground and measuring the sound waves that are reflected from the rock layers deep within the ground. These reflections are processed and formed into images of the subsurface using supercomputers. The technology is similar to the use of a sonogram in the medical field. The acoustic pulses are typically generated by vibrating the Earth with specially equipped trucks, a technology known as Vibroseis that was invented by ConocoPhillips about 50 years ago. After gathering the seismic data and processing it into an image, 3-D computer models of the reservoir can be created. These detailed models allow our geologists and geophysicists to map the subsurface geology in great detail, helping us to better predict where oil and gas is located and determine where best to drill an exploratory well. Marine seismic surveys are conducted using specially equipped vessels that tow both the marine seismic source and the recording systems in the water behind the vessel. The recording systems typically consist of one or more sensor cables, known as streamers. The streamers are deployed just beneath the surface of the water and are usually towed a few hundred feet behind the vessel. The streamers can be up to 20,000 feet long. The marine seismic source, usually an air gun, releases compressed air in pulses into the water column. The sound waves from these pulses travel down into the subsurface and are reflected from the rock strata to be recorded by the streamer systems. Marine seismic acquisition is not limited to the use of towed sensors or streamers. It is also possible to lay recording devices, known as geophones and hydrophones, on the sea bed and record data from energy generated by a separate source vessel. Sea-bed recording is usually used when water depth or infrastructure make acquiring a towed-streamer survey difficult. 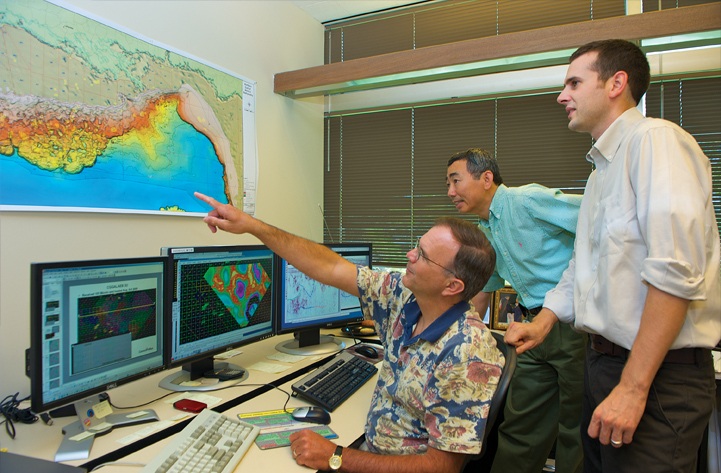 We are continually innovating and improving our core exploration and production business by developing and applying state-of-the-art seismic data acquisition and processing techniques, such as life-of-field, time-lapse seismic data collection, which monitors long-term performance and development of subsea producing reservoirs. We are also able to create better reservoir images beneath salt and other sound-blocking materials, using detailed geological architecture and hydrocarbon quality analyses. The development and application of these geologically integrated seismic-imaging technologies produce higher-quality images that help reduce exploration risk and maximize resource recovery. Variations in the Earth’s gravitational field can be used to map changes in the density of formations in the Earth. Gravity surveys can be used to map the extent or depth of sedimentary basins or even individual hydrocarbon prospects. ConocoPhillips geophysicists also use a technique known as gravity gradiometry to measure the density of the subsurface – or the rate of change of rock properties. From this information it is possible to build a picture of subsurface anomalies which can then be used to more accurately target oil, gas and mineral deposits.